Top 10 Reasons to Buy Organic and Why Every Kid Needs Organic Food. Who cares about Hippie-Hypochondriac's and their "Organic" food! Well...you should, for starters. 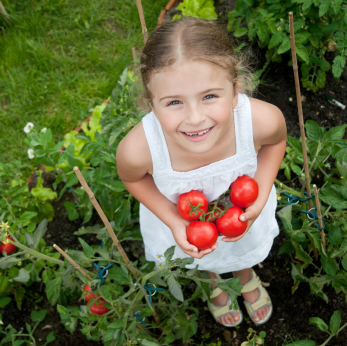 Read our Top 10 Reasons to Buy Organic and The Top 10 Reasons Why Every Kid Needs Organic Food. 1. Organic products meet stringent standards. Organic certification is the public?s assurance that products have been grown and handled according to strict procedures without persistent toxic chemical inputs. Cloned food, neurotoxic solvents, carcinogenic fumigants, rBGH and genetically engineered organisms (GMO's) are strictly prohibited in organic food production. Interesting how swiftly GMO's were rushed to market, when organic fought for 13 years to become federal law. Eleven years ago, genetically modified food was not part of our food supply; today an astounding 30 percent of our cropland is planted in GMOs. Many EPA-approved pesticides were registered long before extensive research linked these chemicals to cancer and other diseases. Organic agriculture is one way to prevent any more of these chemicals from getting into the air, earth and water that sustain us. Numerous studies also show that pesticides can adversely affect the nervous system, increase the risk of cancer, and decrease fertility. Studies also show that children who switch to an organic diet dramatically reduce the level of pesticides in their bodies. 4. Organic farms respect our water resources. 5. Organic farmers build healthy soil. An organic farm is the equivalent of reforestation. Industrial farms are the equivalent of clear cutting of native habitat with a focus on high farm yields. Visit an organic farm and you?ll notice something: a buzz of animal, bird and insect activity. These organic oases are thriving, diverse habitats. Native plants, birds and hawks return, usually after the first season of organic practices; beneficial insects allow for a greater balance, and indigenous animals find these farms a safe haven. Organic agricultural respects the balance demanded of a healthy ecosystem: wildlife is encouraged by including forage crops in rotation and by retaining fence rows, wetlands, and other natural areas. Organic farmers have led the way, largely at their own expense, with innovative on-farm research aimed at reducing pesticide use and minimizing agriculture?s impact on the environment. Organic can feed the world. Scientists and civic leaders in 57 nations have agreed that agroecological methods ? not biotechnology ? are the best hope for feeding a growing population. 10. Organic abundance ? Foods and non-foods alike! Now every food category has an organic alternative. And non-food agricultural products are being grown organically ? even cotton, which most experts felt could not be grown this way. Why Every Kid Needs Organic Food. 1. Fewer toxins will go straight into their bodies. The recent Stanford study had some interesting findings: Organic foods, as you would expect, have much fewer pesticide and other residues on them. (Kind of the point of Organic Foods) All those thousands of chemicals that farmers put in foods, and now biotech companies put into the seeds foods are grown from, are harmful to kids. The first studies on GMOs coming out of Europe (Because American scientists have not been allowed to study them) show that GMOs are causing incredible health problems in animals, from digestive distress to fertility problems and miscarriages, as well as tumors and cancers. If your kids are not eating organic foods, they are eating GMOs right now. Untested on humans. Oh, yeah, your kids are the test. And by the way, this is what "less government regulation" is all about. 2. Fewer antibiotics will be used, so the strength and power of antibiotics won't be diluted when our kids they really, really need them. Antibiotics are used in factory animal farming because--lo and behold--it's cheaper to feed them than food, and they make the animals fat real fast! Farmers can buy 50-pound bags of antibiotics at an Agway without a prescription! And then what happens is both the animals and humans who eat those animals become resistant to the very antibiotics that could save their lives. The germs become resistant, leading to hard-to-treat antibiotic-resistant infections like MRSA. 3. Fewer toxins will go into the environment surrounding your children. There is only one truly definitive, beyond-a-doubt-scientific-and-medical connection and known cause of childhood leukemia: lawn chemicals. Seriously?! How much does it cost to apply chemicals to your lawn? How much does organic food cost? How much does it cost to treat a child and, for God's sake, hopefully, save the child's life once he or she is diagnosed with leukemia?! These are the economic connections we need to be making. Forget the price of a gallon of milk or a dozen eggs (which are artificially subsidized by the government and industry to make them appear much cheaper than organic). It's the price of the health of your child. 4. Your kids will be more likely to grow up healthy and reproduce safely, providing you with grandkids! Many of the chemicals in use in farming today are known to be endocrine and hormone disruptors. Both types of chemicals seriously affect both the reproductive systems and the sexual development of children. The simplest way of saying it is that these chemicals have the potential to make your boys into girls and make your girls sterile. Endocrine disruptors also lead to obesity and diabetes. 5. Chemical foods lead to reductions in IQ in children. While it may not be as definitive as the childhood leukemia and lawn chemical studies, I have seen quite a few studies that show a connection between pesticides and insecticides and reduced IQ. Remember, many of these chemicals are neurotoxins to living creatures, and our children are small living creatures. Let's keep them safe AND smart! Rather than only looking at behaviors and the junk food we put into our bodies, we need to start also looking at how that junk food is grown, and what's in it by default.